From selecting a restaurant to shopping for luxury stuff, people need to know that they are on right track before they shop. When looking for the answer to that question, customers almost always want to know from other customers. The best way to influence your prospective customers is with customer testimonials. By showcasing your existing customers, you can encourage potential customers to buy your products. In this article, we’ll discuss 8 examples of customer testimonials that will inspire you and show the power of customer testimonial. 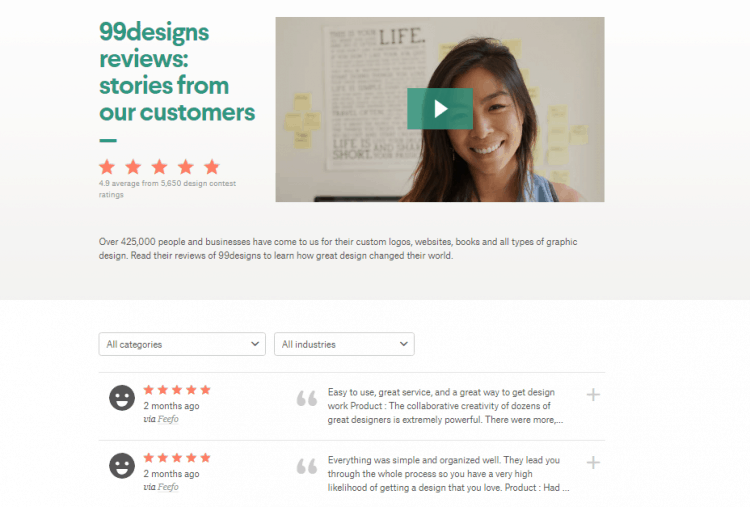 ChowNow’s customer testimonial page is a simple design. The best thing about their testimonial collection is production-quality “client stories” videos. The videos feature some great shots of the clients, their offices, and their food. This style is clean and straightforward. A new web design that has the quote with a picture of the person to gain even more trust! The bright, smiling photos that Marie Forleo’s B-School testimonial page has, gives different impression that the customers are happy, successful, and friendly. People just like her target clients, who are successful, hope to achieve it too from getting enrolled into its program. 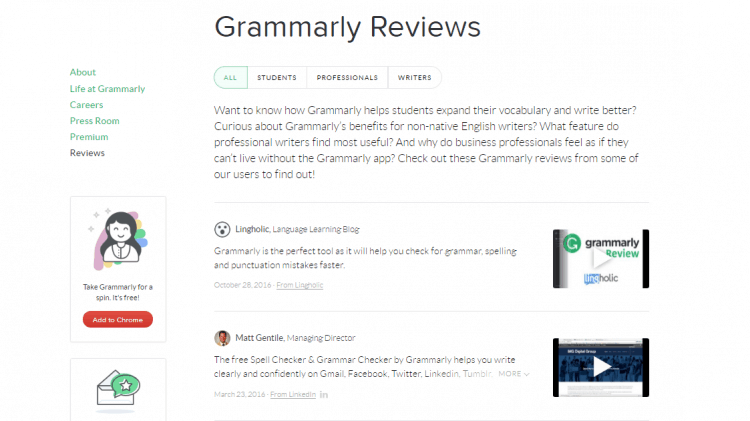 The testimonial page of Grammarly contains a huge collection of videos, quotes by the users. All the testimonials present here comprise client names, along with their picture & places. In some reviews, you can see their more details like designation and site name. 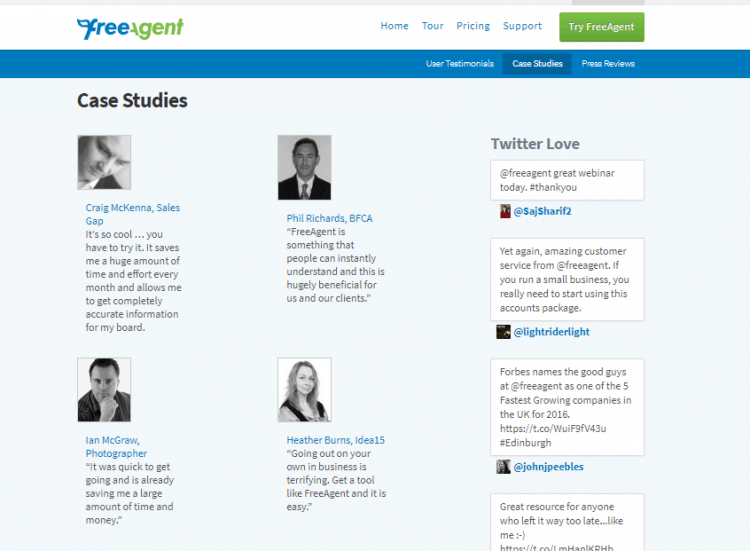 FreeAgent’s case studies page includes a brief testimonial and several other social media testimonials. Its page is composed of short quotes and clean layout that possibly urge the visitors to read. The USP of the page is its highlighted text quotations along with pictures, and names. But what is most interesting about it is their “Twitter love” banner on the right-hand side of the page. Branding testimonials with photographs is a great way to let your audience know that your testimonials are trustworthy. 99designs testimonial page consists of all the major features you’d need in a testimonial page: a noticeable video at the top, customer quotes along with pictures and names, and five-star rating to show how good 99designs’ service and product is compared to others. Codecademy has “Codecademy Stories” as their testimonial page. They’ve incorporated their customer quotes along with pictures, names, and locations above a link to the testimonial page. 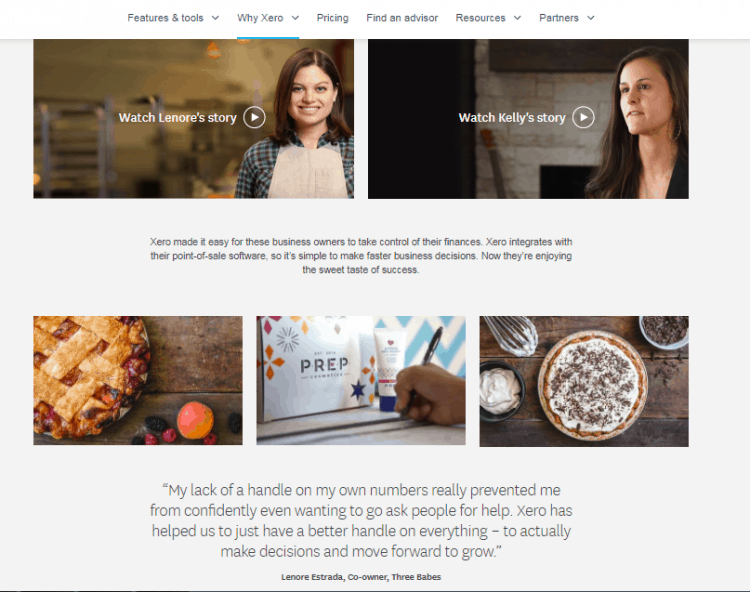 When you click into any story, you can read the whole success story in a Q&A format. Codecademy nailed down its testimonial page with a clear and well-design approach. Xero’s website includes customer’s quotes alongside photos, videos, their names, company, for different industry type. To avoid visitors from clicking on the main testimonials page, the videos pop up on the current page when you click them. Shopify success stories page is different from other testimonial pages. It has one astounding new idea: There’s a noticeable call to action (CTA) that asks Shopify users to share their own stories! Testimonials can be a great way to display your expertise in your field. They are important for generating sales, so don’t delay. Choose testimonial page from above designs and implement it on your website today!